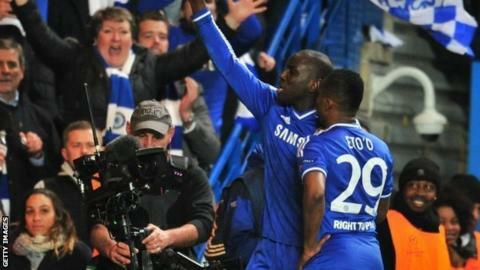 Chelsea's Champions League hero Demba Ba has backed the club's strikers after criticism from manager Jose Mourinho. Substitute Ba scored Chelsea's crucial second goal in a 2-0 win over Paris St-Germain, the club he supports, to secure a place in the semi-finals. Mourinho bemoaned the lack of a "real striker" for the first leg and played winger Andre Schurrle up front. "We have three great strikers and I think that a lot of clubs would like to have them," Ba responded. After losing 3-1 in Paris, Chelsea outclassed PSG at Stamford Bridge and all three of Mourinho's strikers - Samuel Eto'o, Fernando Torres and Ba - played a part as the Blues edged through on away goals. "Maybe he [Mourinho] doesn't have strikers to his liking," said Senegal international Ba, who replaced Frank Lampard on 66 minutes after Schurrle had opened the scoring. "I'm happy to have liberated us. I haven't been given my chance much this season and I've taken it. I'm not out for revenge." After the match, Mourinho praised the attitude of bit-part player Ba, who has scored six goals in 23 appearances this season. "I'm happy for him. A good guy, a good professional, a good group man," said the Chelsea manager. Chelsea have reached the Champions League semi-finals in seven of the last 11 seasons. Jose Mourinho has won 15 of his 22 Champions League games in charge of Chelsea at Stamford Bridge (W15 D5 L2 - excl. qualifiers). "The fact I played him before Nando [Torres] made him feel that he doesn't have the number three striker on his back. His enthusiasm was fantastic and he started giving Paris problems that, normally, they don't have in their league where it's a completely different style. I'm so happy he scored the goal because it means a lot for him and a lot for us. "The players followed our plan, our ambition. And we were lucky because we have the result we fought for. But, if for some reason, we hadn't scored the second, or if they had scored from the last corner in the last moment to send us out, everybody in this club would still have been proud of the boys." Ba, the only Parisian on the pitch when he came on, added: "It's the first time I've wished PSG to lose and it's me who scores the goal, luckily for Chelsea. "I'm happy for Chelsea but it's hard to see them lose, especially with one of my best friends, [former Newcastle team-mate] Yohan Cabaye, on the other side. "Eden Hazard kept telling me all day, 'It's your time tonight, it's your time tonight'." Meanwhile, Mourinho has said it does not matter who Chelsea face in the semi-finals, having reached the last four for the seventh time in 11 seasons. "If the quarter-finals had eight fantastic teams, imagine the four that are going to reach the semi-finals," said Mourinho. "A big opponent is waiting for us but it doesn't matter who." Chelsea are joined in Friday's draw by Real Madrid, with Manchester United's quarter-final at Bayern Munich and Atletico Madrid's visit of Barcelona both level after the first leg. Mourinho's unbeaten run in European quarter-finals extends to nine and raises the possibility of Chelsea repeating their 2012 triumph, when they beat Bayern Munich in the final. Roberto Di Matteo was in charge of the Blues for that success but was sacked six months later. Mourinho marked Ba's late winner by running down the touchline in scenes similar to those in 2004, when his Porto side knocked out Manchester United at Old Trafford. "No, it was not to celebrate," said Mourinho, who has won the trophy with both Porto and Inter Milan. "It was to tell the players how we have to play the last 10 minutes. "I knew at that moment they wanted to celebrate, they wanted to think the game is over. They forget that they had three plus another three or four minutes to play." PSG boss Laurent Blanc praised Chelsea for not giving up. "They believed right to the end and were rewarded," said the French World Cup winner. "Good luck to them." Blues defender Branislav Ivanovic is suspended for the first leg of the semi-final after a caution on Tuesday. The first legs will be played on either 22 or 23 April, with the returns a week later.